I hate books that have a good story line, but are so difficult to read because they are written by poor authors and I felt that The Girl of Fire and Thorns was one of those books. I was initially intrigued by this book, because I always like when someone comes up with a new fantastical element to write about. In this book, the main character, Elisa, has a large jewel in her navel called a Godstone. Since nobody has thought to put a priceless gem in anyone's belly before, I thought it might be rather interesting to see what it means. Unfortunately, that was the only interesting part about the story. Elisa could have been a really fantastic main character, because she is not tall, thin and beautiful. She is short and fat and plain looking. Rae Carson could have done a wonderful thing and made her into a respectable hero that young girls could look up to and say, "Hey. She isn't skinny and popular, but she saved the world, and so can I." Instead, Elisa dwells on her obesity and brings it up, ALL THE DAMN TIME! It got to be so incredibly annoying. Not to mention the fact that the same words and phrases were used to describe how fat she was. She was also annoying because she dwelt upon all the unhealthy and overindulgent things she was eating. I kind of felt that this book was perhaps driven by the author's own struggle with weight (if she has one) and that she used the book to get all her thoughts out. Like I said, I don't know if that's the case, but that's what it felt like. I also felt that she pushed the elements from he title onto the story. 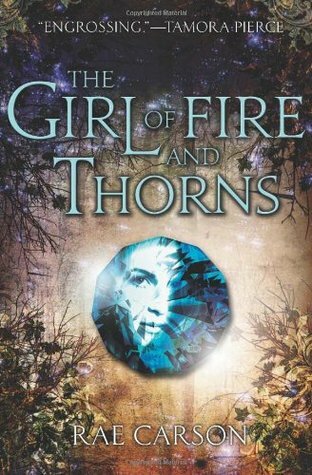 When fire and thorns show up in the story, I felt like they were simply put there because they were in the title and she needed to make the title relevant. Besides Elisa being an annoying character, the book had an interesting plot line and series of events, but it just wasn't presented in anything resembling an enjoyable read. I gave it 3 stars because I did like the story, and I think an actual young adult reader would be able to overlook the poor writing style, but I just couldn't.